Professor Karen Emmorey's work featured in Newsweek. Dr. Greg Holland and his team use nuclear magnetic resonance (NMR) to study the structure of spider silk and the silk-producing process. 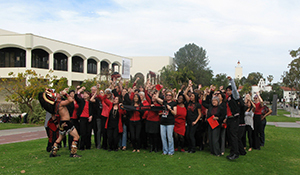 Established in 1943, San Diego State University Research Foundation (SDSURF) is a non-profit auxiliary corporation authorized by California's Education Code to support San Diego State University. Our mission is to support and further the vision and research objectives of San Diego State University and to help faculty and staff find, attract and administer their research and sponsored programs.